Fall always makes me think of my Mom and daffodils. My Mom loved to garden. I got my love of gardening from her. She especially loved to plant bulbs in the fall, before winter set in and the world goes gray and into hibernation. It’s a way to look forward to spring. I love daffodils too, especially large sweeping plantings of them. They are not around for long, but they are the epitome of spring arriving. Sunny and mellow and totally unpretentious, they remind me in that way of my Mom as well. White Flower Farm is an amazing nursery/garden nirvana near where I grew up in Connecticut. They have oodles of bulbs, of all varieties–tulips, crocuses, and daffodils galore. A great thing about good daffodils is that they can self-propagate, so if you plant a few this year, you’ll have more next year and over the years, more and more. (As an aside, east coast daffodil blooms are way better at spreading than on the west coast—I guess you need that cold burst, Spring and daffodils are one of the few east coast things I miss living in California). When I lived in Boston, my Mom and I would go to White Flower Farm and get bulbs this time of year, and now, as a way to remember her, I make a point each fall of sending a bag of bulbs to a friend. 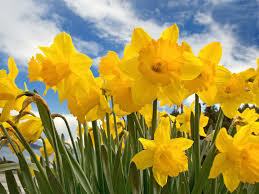 I like the idea of sunny fields of daffodils in memory of Mom.